Every year the Architectural League of New York recognizes eight dynamic young firms as Emerging Voices that have the potential to become leaders in the field. Historic winners like Morphosis (1983) and Toshiko Mori (1992) have become today’s lions, and practices like Johnston Marklee (2007) and Tatiana Bilbao (2010) have jumped to new heights after recent wins. This year’s crop was selected in a two-stage portfolio competition where a jury of architects selected the winners. The deciding jury included several previous winners like Dominic Leong (2017), Fernanda Canales (2018), and Marlon Blackwell (1998), giving the process a familial feel. Laureates for 2019 come from across North America and almost all are partnerships or collaboratives—capital letters feature prominently, too. FreelandBuck will lecture at the Scholastic Auditorium at 130 Mercer Street, New York, New York, at 7:00 p.m. on March 14, as part of the Emerging Voices lecture series. FreelandBuck builds drawings. Not in the traditional sense of constructing what’s represented by a drawing set, but in the sense that its architecture directly evokes carefully constructed perspectives and painstakingly hand-drawn renderings. “We think about drawing at the scale of architectural space,” says partner Brennan Buck, “as an end product, not a means to build.” Buck, based in New York City, and David Freeland, who is based in Los Angeles, met in grad school at UCLA and started working together in 2009. Of their bicoastal practice, Freeland says, “There are more opportunities than challenges. It exposes us to different groups of potential clients, but also to different environments. I think the practice is richer for that.” Working at a variety of scales also makes the practice richer, giving the firm the chance to explore its ideas in different ways. Parallax Gap, a colorful canopy of layered screens installed in the Smithsonian American Art Museum’s Renwick Gallery in Washington, D.C., feels like a drawing come to life. The intricate trompe-l’oeil representations of historic American ceilings are like perspective drawings—each constructed with a unique vanishing point—that reveal themselves as visitors walk through the space. FreelandBuck borrowed rendering techniques to enliven the riff on office cubicles the firm designed for a film production company in L.A. To accommodate the company’s variable spatial needs and match its lighthearted style, the architects defined flexible work areas with a series of “tumbling” cubes whose milled surfaces, evoking a poché or hatch, suggest another set of cubes overlaid onto the first. Furniture that looks torn from a Roy Lichtenstein canvas adds to the effect of stepping into a drawing. Although there are nods to linework in the exterior finishes used on two of the firm's residential projects, Stack House and Second House, these connections to representation are more complex. In both buildings, distinctive exterior volumes articulate dedicated programs, and in both buildings, this distinction is broken down by unexpected interior elements. Stack House’s curved walls blend its spaces together, while Second House achieves a sense of continuity through materials, transparency, and interior courtyards. The perspectival shifts of Parallax Gap appear here in more subtle ways, concealing and revealing spaces, views, and experiences; it’s not about adding lines, it’s about erasing them. FreelandBuck may draw on the techniques of representation but, unlike a conventional drawing, its work can’t be understood through a single image. Like the best architecture, the spaces, places, and objects the firm creates are challenging and engaging and must be experienced to be fully appreciated. 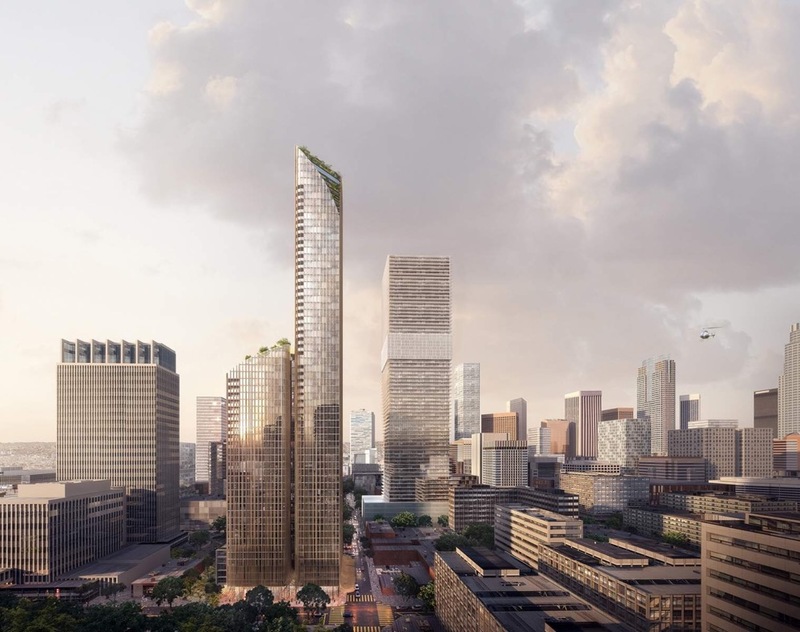 A new mixed-use tower slated for a growing section of Downtown Los Angeles designed by Australian firm Koichi Takada Architects could rise as high as 70 stories, new renderings reveal. Urbanize.LA reported that Australian developer Crown Group had previously submitted plans for a 52-story tower with 528 residential units and ground-floor commercial spaces for the site. The taller iteration of the project was first reported by ComercialRealEstate.com, but it is unclear how many housing units will be included in the revised scheme. New renderings for the so-called Sky Trees LA project showcase a grouping of thin, rounded towers of various heights capped by arched profiles and tree-lined rooftop terraces. Inspired by California’s redwood trees, the clustered towers will come wrapped in natural materials, including timber mullions. Along the street, a wavy wooden awning that is reportedly inspired by the billowing forms of Marilyn Monroe’s wind-swept dress in Billy Wilder’s The Seven Year Itch will provide shade for pedestrians. (Nevermind that the iconic scene took place above a subway vent on Lexington Avenue in New York City.) 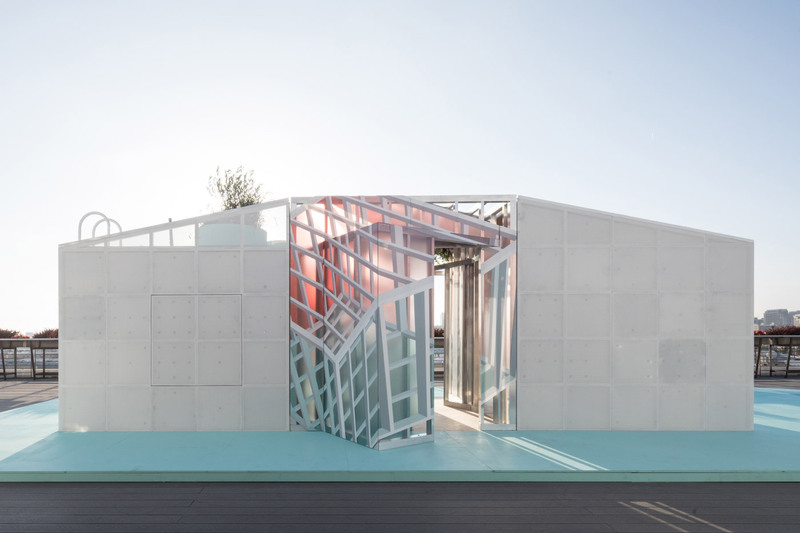 Architect Koichi Takada told ComercialRealEstate.com that the design of the canopy aims “to challenge L.A. to become a more walkable city” while also creating yet another “Instagram moment” for Downtown Los Angeles. The project is one of many planned and under construction in L.A.’s South Park neighborhood, an area where until recently, only the 32-story William L. Pereira–designed Occidental Life building from 1968 towered above surrounding warehouses and commercial buildings. That has changed rapidly over the last three years as nearly two dozen towers have been proposed or completed along the north-south Figueroa Corridor nearby. That includes the troubled Oceanwide Plaza project by CallisonRTKL that recently halted construction due to murky finances and potential links to an ongoing political corruption scandal. The Sky Trees LA project will join a growing east-west spine of towers set to rise perpendicularly to the Figueroa Corridor around 11th Street. A timeline for the project has not been announced. Los Angeles’s homelessness crisis has quite literally reached the offices of City Hall. In recent weeks, a typhus outbreak that has been tied to the explosion of encampments around the city has migrated into the building via flea-carrying rats. The Los Angeles Times reported that at least one city employee had possibly contracted the disease while at work, and many others have spotted rodents around the premises. 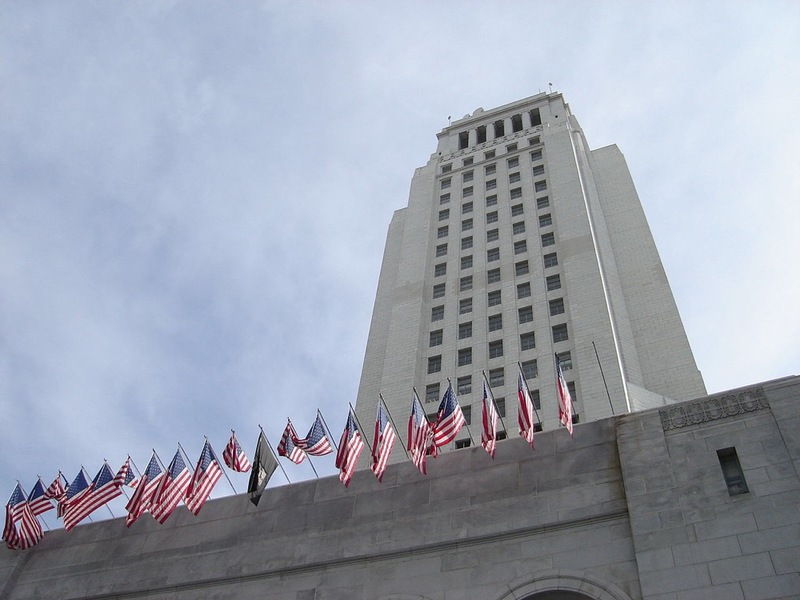 Apparently, L.A’s City Hall is plagued by a stubborn rat infestation. According to The Times, rats have been spotted at various city-held events, including a Halloween celebration last year during which a rat was observed gnawing on a decorative pumpkin. The rats have been observed living in office plants around the complex while fleas have infested the City Hall carpets, as well. City Council President Herb Wesson recently moved to investigate how much it would cost to have all of City Hall’s carpets removed and replaced with some other type of flooring. Wesson has also launched a review of the complex’s office plants to deduce which ones are most hospitable to the rodents. 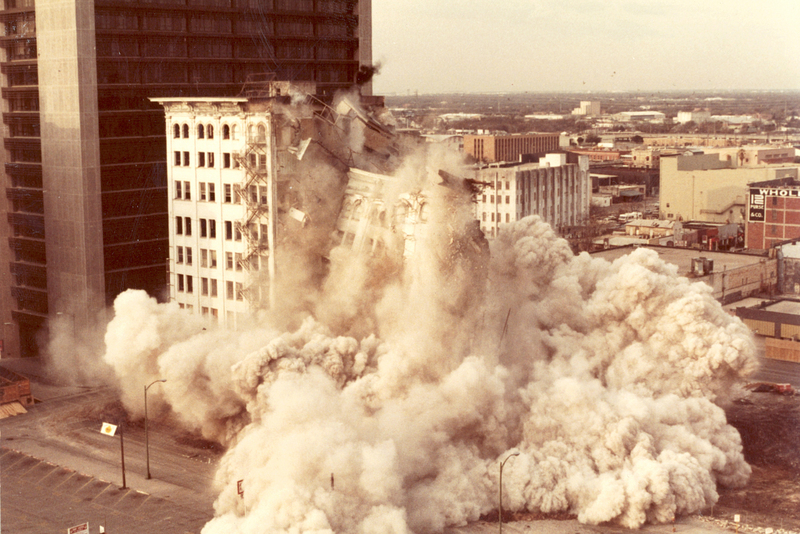 Wesson has implied that the ongoing demolition of the Welton Becket–designed Parker Center nearby could also be a potential source for the increase in rats around City Hall. Health officials across the state have been battling various disease outbreaks—including a deadly Hepatitis A outbreak in San Diego—that have proliferated as the number of unhoused Californians has skyrocketed in recent years. Los Angeles County officials declared a typhus outbreak in Downtown Los Angeles. A 2018 point-in-time count by the Los Angeles Homeless Services Authority found that 31,285 Angelenos were living outdoors across the city. What do architects want from a Green New Deal? As the scale of climate change has accelerated and grown direr in recent months, upstart politicians like Alexandria Ocasio-Cortez of New York have made addressing the issue a central part of their political platforms. Talk of a Green New Deal (GND) has picked up since November's elections, reflecting a major shift in how Americans discuss climate change. But what is the Green New Deal and how might it impact architects? The impetus behind the GND is simple: Because the threat of anthropogenic climate change is so fundamental, only a government-led, war-like industrial and economic mass mobilization effort can potentially transform American society quickly and thoroughly enough to avoid global catastrophe. There are plans to unveil the first round of draft legislation at the federal level this week, but as of yet, no official set of policies has been agreed upon by legislators and activists. But various elements of a supposed GND have been touted for years (see here and here for thorough explainers). First, activists are calling for the wholesale decarbonization of the U.S. economy. That means eliminating all carbon emissions across every industry in the country, including in vital sectors like energy production, building design, construction, and transportation. Second, this transition would include a federal jobs guarantee backed by the large-scale deployment of new public works projects. A job guarantee, which, generally speaking, would provide anyone who wanted work with some form of federal employment, would allow people currently working in carbon-intensive industries to leave their jobs for publicly-funded green-collar work. The guarantee, supporters argue, would create a vast, fairly-paid workforce that could get to work transforming American society right away. Third, activists pushing the GND generally agree that the transition to a carbon-free economy must incorporate socially-just practices that rectify past practices that have exploited certain communities. Such reforms include finding ways to house people displaced by climate change, countering the long-term effects of redlining and the racial wealth gap, and making sure that unlike the original New Deal, the benefits and jobs created by any GND are enjoyed by people of color and other historically marginalized groups. 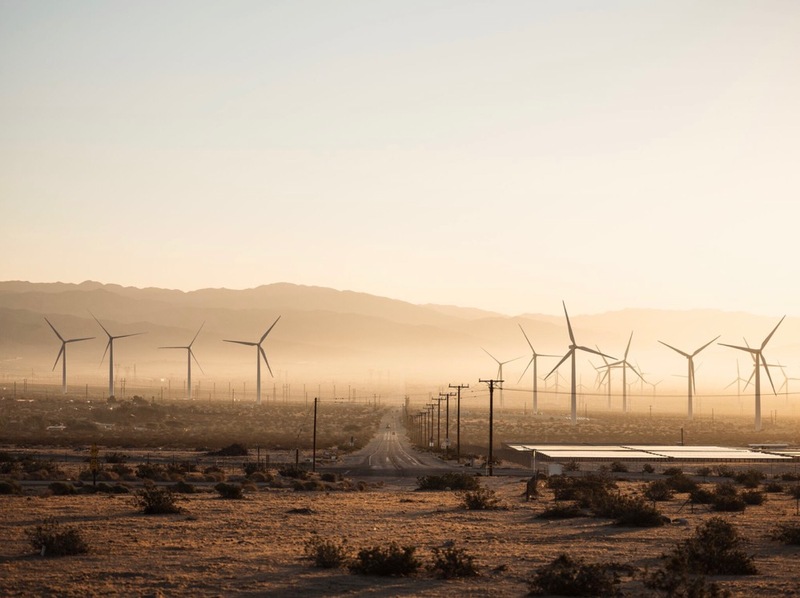 The initiative would go beyond simply greening the country's energy grid or incentivizing a shift to public transit and electric vehicles; the GND envisions a top-to-bottom reworking of the U.S. economy. Likely, the effort will involve densifying existing cities, building new ones from scratch, and perhaps most importantly, retrofitting and upgrading nearly all of the country’s existing building stock. Architects will be vital to the effort and are likely to benefit from a potential GND through new commissions and opportunities to provide input and expertise across a range of projects and scales. In an effort to help spur discussion among architects on a potential plan, The Architect’s Newspaper asked designers from around the country to share their wish lists for what a potential GND might include. The responses span a range of issues that touch on the built environment, project financing, building codes, and environmental regulation, among other topics. For other architects, increasing the scope of public transportation options in parallel with boosting density is the way forward. Vishaan Chakrabarti, founder of PAU in New York City, said, “A Green New Deal should include what I called the 'American Smart Infrastructure Act' in my 2013 book A Country of Cities. In that proposal, I call for the elimination of existing subsidies that encourage sprawl like highway funding, the mortgage interest deduction, and low gas taxes.” Chakrabarti argued for applying this new revenue toward building a national high-speed rail and urban mass transit network that can serve new investments in affordable transit-oriented multi-family housing and low-cost office space. The funding, however, “should only go to municipalities that discourage single-family housing density, like Minneapolis recently did,” Chakrabarti added. Of course, the overarching network of regulatory policies, like environmental, structural, energy, and seismic codes, that shape the built environment could be improved, as well. Anica Landreneau, director of sustainable design for HOK in Washington, D.C., pointed to the recently-adopted Clean Energy DC Omnibus Act, which she helped craft, as a potential guide for creating a “self-improving threshold” that requires building owners to retrofit existing structures above a certain size according to rigorous energy performance standards. 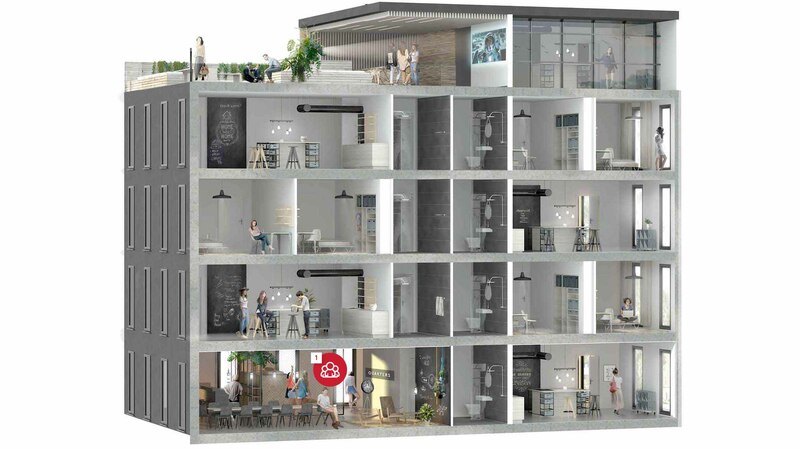 The plan, set to take effect in 2020, seeks to align the energy performance of existing buildings with the steadily-increasing performance metrics crafted for new structures, like LEED certification and Energy Star ratings. The plan will peg the performance standards for existing buildings to the median Energy Star score for all buildings of the same type in the District of Columbia. As the overall energy efficiency of buildings in the District improves over time, the thinking goes, periodic post-occupancy reviews will help create a self-improving target that will compel building owners to upgrade their structures to avoid fines. In addition to improving incentive programs like the HTC, changes to the way projects are financed more broadly could also help bring to life many of the GND's transformative new projects. In conversations with architects, the issue of affordable urban housing came up often, especially in relation to the stated aims of the GND’s main backers, which include increasing social equity through the program. Because America’s urban areas contain 85 percent of the country’s population and are responsible for 80 percent of the country’s gross domestic product, it is likely that the GND’s effects will be most profoundly felt in cities. That’s important for architects concerned with racial and social equity in the field. With a rising cohort of diverse young designers—as well as many established firms helmed by women and people of color— it’s possible a potential GND could engender a surge of important projects helmed by diverse practitioners. That possibility, when coupled with the existing diversity of urban residents and potential clients, could transform how architecture is practiced across the country. With a “quadruple bottom line” approach at the center of a potential GND, professional architecture organizations pushing for increased equity among their ranks, and demographic trends leading to greater diversity, the architectural profession is poised for significant change that could be accelerated by a GND. Someone has stolen key works of furniture designed by Frank Lloyd Wright and R.M. Schindler from a University of Southern California (USC) storage facility. The Los Angeles Times reports that a pair of lamps designed by Wright and a cushioned chair by Schindler disappeared from a South Los Angeles warehouse in 2012. The items, likely worth tens to hundreds of thousands of dollars, were brought to the storage facility from the Samuel Freeman House, a textile block–style home designed by Wright in 1923. According to The Times, the theft had gone unreported until recently, when a reader sent an anonymous letter to the newspaper detailing the suspected theft. The Samuel Freeman House is located on a slope in L.A.’s ritzy Hollywood Hills. It is designed to take advantage of the changing grade to make the three-story home appear from the street to be shorter than it actually is, according to the Frank Lloyd Wright Foundation website. Like the Ennis, Storer, and Millard homes, the Freeman Residence is built on a modular grid from thousands of 16-inch precast concrete blocks—12,000 in this case—designed by Wright to unify aesthetic expression and structural assembly. The resulting home cascades down its rugged site, revealing a partially-submerged bedroom level and descending terraces. Throughout its life as a private residence, the Freeman home hosted salons and other gatherings. In 1986, the owners donated the home to the USC School of Architecture. Like several other textile block homes, the structure was heavily damaged in the 1994 Northridge Earthquake; it was structurally stabilized by the university in 2005. The home is currently undergoing additional renovations due to the earthquake damage. The textile block homes were built using only the aforementioned blocks and with little in the way of shear walls, lateral structure, or other seismic safeguards. While Wright designed the initial structure, Schindler renovated and added to the residence in the decades after it was completed. 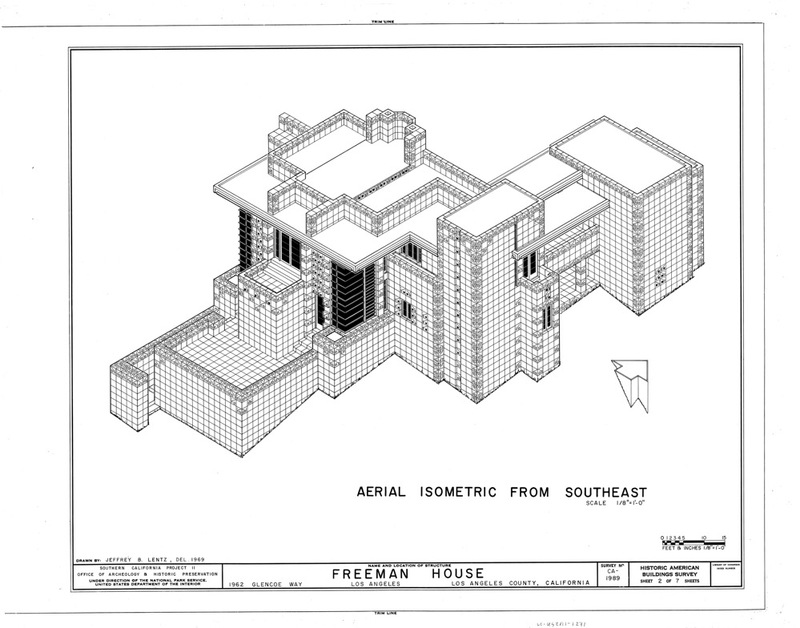 See here for a full set of Historic American Building Survey drawings and other information on the Freeman House. Since USC acquired the home, it has been used extensively as an educational tool and venue. In 2000, as USC geared up to renovate the home, the items in question were moved to the storage facility. A few years later, the items had disappeared. According to The Times, the circumstances surrounding the stolen furniture are somewhat strange. First, the items were located in a locked room that could only be accessed by a limited number of people. There are no suspects as of yet, but it appears that whoever stole the pieces likely had previous access, as investigators have not uncovered signs of forced entry into the storage area. Second, despite word of the missing items reaching the upper levels of the USC School of Architecture administration, the theft went unreported to authorities for years. And then there’s the issue of a recently-auctioned textile block believed to belong to the home. According to The Times, one of the home’s original blocks recently fetched $5,000 in an online sale. It is believed that the slightly-damaged block was removed from the home’s garage, perhaps directly after the Northridge quake or during the renovations. To boot, several other furniture works by Schindler were recently stolen from another storage facility in Los Angeles, this one managed by the Friends of the Schindler House, a nonprofit that maintains Schindler’s former residence in West Hollywood, home to the MAK Center for Art and Architecture. It is unclear if the two thefts are connected. According to the report, the Los Angeles Police Department is conducting a preliminary investigation into the missing pieces. Missed some of this week’s architecture news, or our tweets and Facebook posts from the last few days? Don’t sweat it—we’ve gathered the week’s must-read stories right here. Enjoy! Everything you need to know about Super Bowl LIII’s Mercedes-Benz Stadium In preparation for this Sunday's Super Bowl LIII, here's everything you need to know about Atlanta's new Mercedes-Benz Stadium, designed by HOK. Work stops on one of L.A.’s biggest construction projects One of L.A.'s largest construction projects, Oceanwide Plaza, is involved in a sprawling corruption scandal, and work on the building was recently stopped. OLIN designing a 400-acre waterfront park for Southern Indiana OLIN has been tapped to design a new 400-acre park along the northern shore of the Ohio River in southern Indiana. Tod Williams Billie Tsien Architects renovates and expands Dartmouth’s Hood Museum of Art Tod Williams Billie Tsien Architects completed a 16,350-square-foot expansion and renovation of the Charles Moore–designed Hood Museum of Art at Dartmouth. Stay warm, and have a great weekend! On Sunday, all eyes will be on Atlanta’s Mercedes-Benz Stadium, the new arena that, less than 18 months after opening, is hosting the biggest sporting event in the nation: Super Bowl LIII. The National Football League (NFL) championship game—this year between the New England Patriots and the Los Angeles Rams—will be played with an architectural backdrop unlike anything in the world. The $1.5 billion Mercedes-Benz Stadium is the most sustainable sports facility on earth. It is LEED Platinum and the only stadium of its kind with a kinetic, retractable roof. 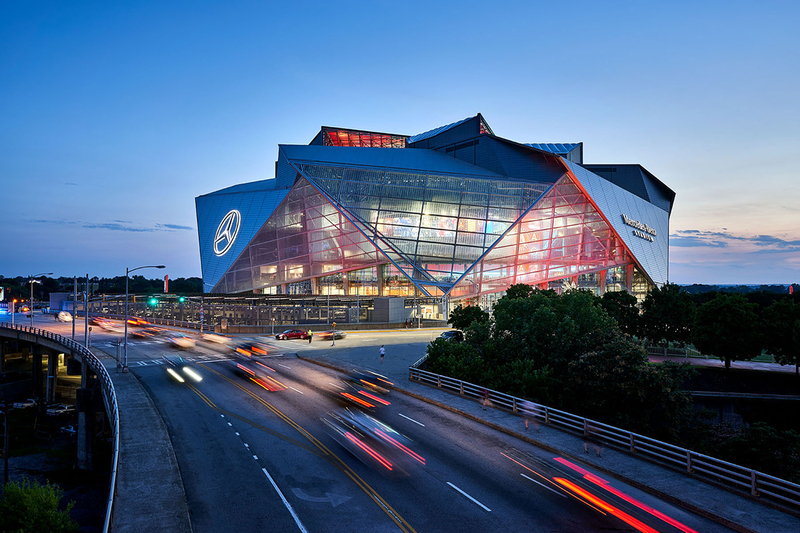 Designed by HOK in collaboration with BuroHappold Engineering, the building broke ground in 2014 and officially opened in August 2017 during the Atlanta Falcons’ pre-season. The sculptural structure replaced the 25-year-old Georgia Dome which was demolished the previous month. 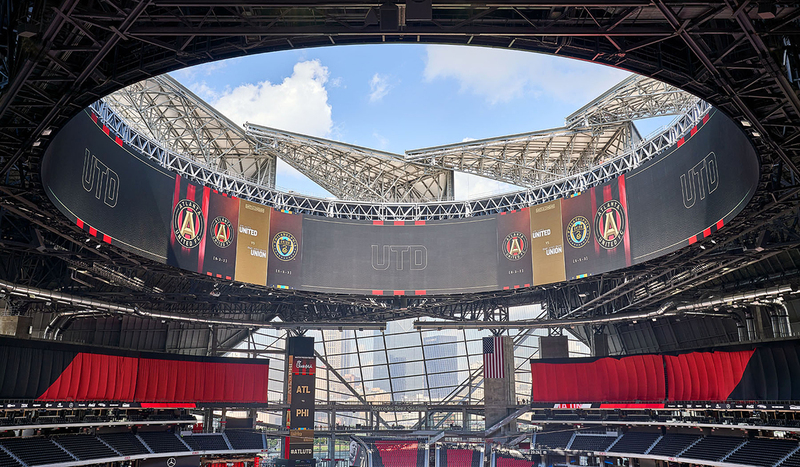 Ahead of the game this weekend, here’s everything you need to know about the 2-million-square-foot Mercedes-Benz stadium: Situated in downtown Atlanta, the Benz (as locals call it) houses 71,000 seats for NFL games and 32,456 seats for Major League Soccer games. It features a motorized scrim attached to the roof structure that can cover several sections. Designed to emulate the Pantheon in Rome, it features a semi-transparent retractable roof that’s nicknamed “the oculus” that lets sunlight into the interior. Bill Johnson, design principal of HOK’s Kansas City office, said this “literal out-of-the-box” thinking was what won the over Falcons’ owner Arthur Blank who bankrolled the project. “We wanted to move away from the typical square roofs you see on most stadiums and come up with something that created energy in the middle,” Johnson said. “The vision was that the opening would create a very tiny pinpoint of light on the Falcons’ logo at the 50-yard line, and as the roof retracted, the spotlight would become bigger and bigger.” The stadium’s kinetic roof consists of eight, 200-foot-long triangular “petals” made of lightweight ETFE (ethylene tetrafluoroethylene). These petals are fixed to 16 individual tracks that can move at different speeds. The Benz now holds the record for the largest application of a single ETFE membrane in the world at 143,000 square feet. The angular facade of the Benz consists of wing-like sections made of insulated metal panels that wrap around the bowl. As a nod to the swooping wings found on the Falcons’ logo, these sections overlap one another and create a feeling of movement on the exterior. The base of the building features a floor-to-ceiling glass curtain wall that lets light into the facility during the day and serves as a 16-story panoramic window to the city. To Johnson, the success of Mercedes-Benz Stadium has been its ability to create social experiences for visitors. “Fans' tastes have changed and people want a big, game-day experience,” he said. “Some of it is driven by social media, and some of it is driven by younger fans who want to get up and move around throughout an event, gathering together and watching things from different angles.” Several aspects define the Benz as ultra-green. It’s powered by 4,000 photovoltaics, including an array of solar panels designed as carports. 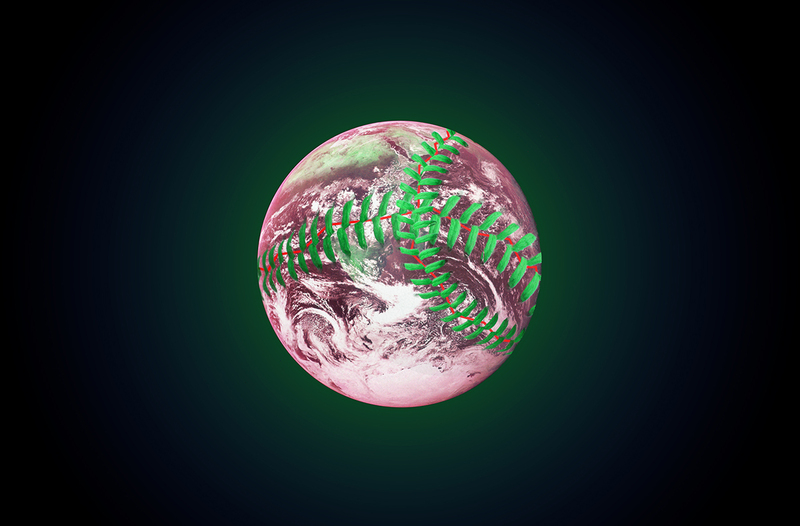 Alone, these generate 617 kilowatt-hours of energy each year for the stadium and the surrounding neighborhoods. According to Johnson, up to 10 NFL games can be powered with this amount of energy. Additionally, underneath the stadium is a 600,000-square-foot cistern that can hold up to 2 million gallons of rainwater. Johnson said the intervention has helped decrease flooding in this area of Atlanta, while simultaneously providing irrigation for local trees. One of the most impressive features of the Benz, according to Johnson, is the 360-degree halo scoreboard that wraps the oculus. It stretches 1,075-feet-wide and six stories high. Over 4,000 miles of fiber-optic cable support the ring-shaped screen, as well as the 2,000 televisions, and other technology found in the building. While this is the first time the Benz has hosted a Super Bowl, it’s the third time Atlanta has won the bid in 25 years. The city put out a proposal midway through the construction of the new stadium. Post-opening, its first big test came last month when it played host to the 2018 Chick-fil-A Peach Bowl. The college playoffs will come back to the Benz in late December and next year, it will host the NCAA Men’s Final Four. For more, check out this timelapse of the Benz's build-out courtesy Earthcam. Bjarke Ingels Group (BIG) has unveiled renderings for a proposed gondola line that could link downtown Oakland, California, with the firm’s proposed baseball stadium development for the Oakland Athletics on Howard Terminal. The proposed gondola line would bridge a 1.3-mile gap in transit access between the Bay Area Regional Transit (BART) system that stops in downtown Oakland and Jack London Square, a site adjacent to the new development. The link is projected to serve up to 6,000 individuals per hour and will take roughly three minutes to make the trip. The proposal has come to light as the A's and BIG work to assuage local stadium-related concerns, which include lack of transit access to the site and preservation issues for the existing Oakland-Alameda County Coliseum, which will be effectively torn down for the project. The new renderings show a conventional gondola system running above the streets of Downtown Oakland. The elevated line will ferry passengers above the street and between the buildings that line the route while picking up and dropping off at raised stations with curved metal and wood walls. Gondolas are having a bit of a moment in American transit planning circles, as two efforts are lifting off in Los Angeles and in other cities. In L.A., a recent proposal to build a gondola line linking the city’s Union Station with Dodger Stadium has gained momentum. A second proposal to build a gondola line to connect various parts of the city to the Hollywood Sign has also gained notoriety as local officials move to accommodate a recent uptick in foot traffic to the remote mountainside sign. Plans for the Oakland gondola are being developed in tandem with the stadium proposal, which calls for new residential, commercial, and cultural programs around the baseball stadium. If all goes according to plan, the new stadium and gondola line could be up and running as soon as 2023. The organizers behind Desert X, an art and architecture–focused biennial that takes place in the Coachella Valley east of Los Angeles, have unveiled this year's participating artists. For its 2019 run, the festival will highlight a who’s-who of rising international creatives, including Venezuelan-born artist Iván Argote, Mexican artist Pia Camil, Irish artist John Gerrard, American photographer Cara Romero, American artist Jenny Holzer, Egyptian-born artist Iman Issa, and the Danish art collective Superflex, among others. In addition to highlighting evocative works of landscape-based installations and sculpture, the organizers have expanded the scope of the exhibition to include film and performance-based projects, according to a press release. This expanded scope will apply to the geographic range of the exhibitions, as well. This year, the organizers have embraced a wide terrain for the works that extends south from Palm Springs to the Salton Sea and the U.S.-Mexico Border. The Desert X 2019 program is led by Desert X artistic director Neville Wakefield and curators Amanda Hunt and Matthew Schum. A goal for the 2019 program is to “embrace a range of ecological, environmental, and social issues that have been driving conversations about our role in the anthropocene,” according to Wakefield. To facilitate this conversation, the organizers plan to hold a symposium titled Desert, Why? at the Palm Springs Art Museum (PSAM). The event takes place between March 1 and 3 and is billed as a “celebration of art and the environment.” The three-day event will highlight Unsettled, a sweeping exhibition of contemporary art from across the Americas that is currently on view at PSAM. Associated performances, panel discussions, and other events will also happen during the symposium across various locations. A podcast hosted by Frances Anderton is set to “explore the environmental, ecological, and social themes in the 2019 Desert X exhibition,” as well. Anderton is the host of DnA: Design and Architecture, a weekly radio show on L.A.’s KCRW radio station. The podcast will be developed in collaboration with Avishay Artsy, a producer for DnA. Desert X kicks off February 9 and runs through April 21, 2019.